Use these steps to help you identify the logical names of your physical network ports. This information will be necessary during the installation and configuration of the operating system. Identify your installed network ports. FEM: This is a Broadcom 10GbE port. 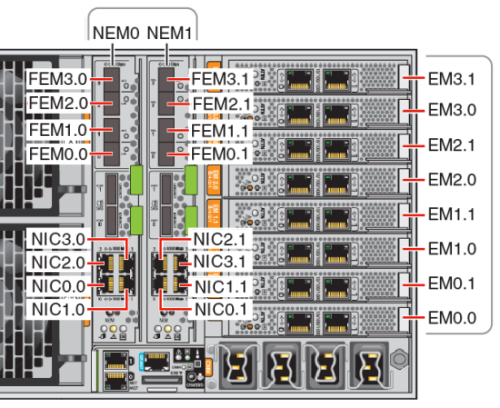 These ports require a Fabric Expansion Module (FEM) installed on each CPU module for each NEM (for a total of two per CPU module). PCIe EM: This is a PCIe ExpressModule (EM) slot. There are two assigned per CPU module. If a network interface card is installed, it can have more than one port. NIC: This is an Intel 1GbE port. There are two assigned per CPU module. 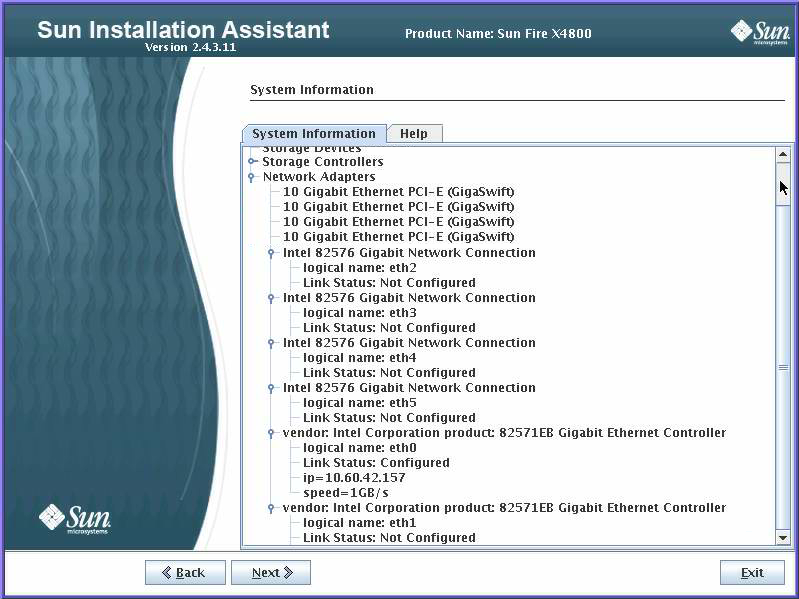 Run the Oracle Hardware Installation Assistant and proceed to the System Information screen to view logical name assignment of your installed network ports. Even if you do not plan on using OHIA to assist in the operating system installation, it will provide important information in identifying installed components. For information about using OHIA, see Oracle Hardware Installation Assistant (OHIA). Installed FEM devices are labeled as 10 Gigabit Ethernet PCI-E (GigaSwift). Installed NIC devices labeled as Intel 82576 Gigabit Network connection. Installed PCIe EM devices have vendor: as the label prefix. An example might be: vendor: Intel Corporation product: 82571EB Gigabit Ethernet Controller. In the following table, make a note of the actual ports installed in the system and their logical names as shown in the OHIA System Information screen. During system boot, ports are enumerated and assigned logical names based on the system PCIe scan order. Note that although OHIA lists the correct logical name (eth0, eth1, eth2, and so on), it does not necessarily list ports by logical name order. Does a Network Port at this Location Physically Exist in the System? Is This Port Active (listed as Configured in OHIA)? Use this information during software installation to ensure network ports are configured correctly.